The general appearance of the Australian Terrier is a sturdy low set dog, rather long in proportion to height. The coat is somewhat course and the colour can be either blue and tan, red or sandy. They have a definite ruff around the neck extending to the breast bone, and a top-knot. Their coat is easy to brush. The Australian Terrier (often referred to as the ‘Aussie’) makes a great indoor house dog but has lots of energy and loves the outdoor environment to run and play. They are sometimes referred to as ‘a little big dog’ or a ‘big dog in a little parcel’. They are natural ‘ratters’ and will hunt small rodents, chase small animals and often attack snakes. They can be trained to behave around chickens and other household pets but it is best to begin this training when they are puppies by introducing them on a lead and by not allowing them to chase the birds or small animals. They need to be protected from exposure to snakes particularly in the summer months as they will attack a snake and this can often be fatal for the dog. In comparison to other breeds, they are generally healthy and robust dogs with relatively few hereditary health problems. DNA testing is available now and most breeders are using this to eliminate ‘known’ diseases such as ‘DM’ or Degenerative Mylopathy. The Australian Terrier temperament is generally good – they are usually an outgoing, friendly dog who enjoys meeting new people and they get on well with children, babies, adults and other dogs. It is very important to socialise the puppies (of all breeds) when they are young. 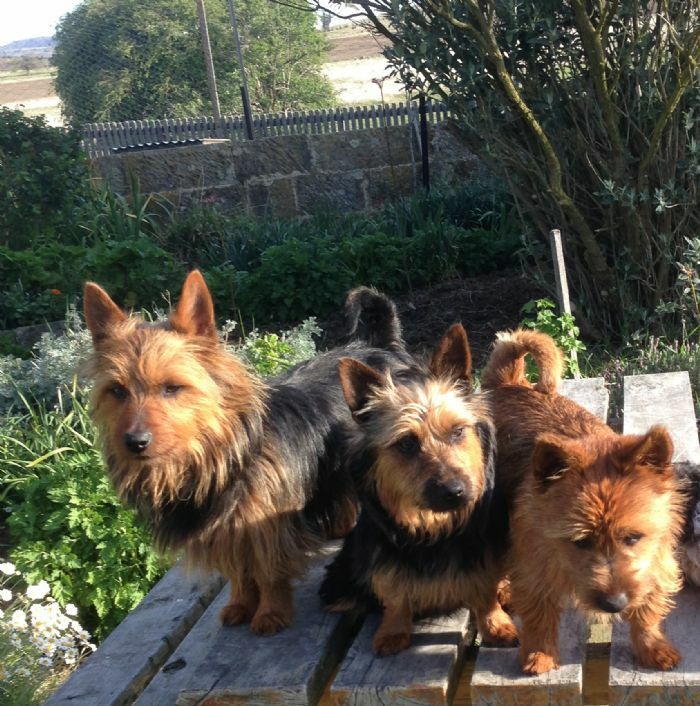 My Australian Terriers are fairly quiet dogs and they are not ‘yappers’.